Intro: Eileen Welsome, a journalist and author, is a first-year OHMA student who in this post examines how a digital innovation at the University of Kentucky’s Louie B. Nunn Center for Oral History is making oral histories more accessible. When someone first mentioned the Oral History Metadata Synchronizer to me, I immediately thought of the Sexatron in the Woody Allen movie entitled “Sleeper.” I don’t know why, exactly, but I think it was because the Synchronizer also had a tech-sounding name. The Sexatron, which was officially called the Orgasmatron, looked something like a tall cabinet. Allen would step into it and exit a few minutes later with his clothes in disarray and a stupefied expression on his face. The Synchronizer, which was developed by Doug Boyd and the Louie B. Nunn Center for Oral History at the University of Kentucky, doesn’t offer the same physical pleasures as the Sexatron, but an argument could be made that the technology is making oral history a sexier business. 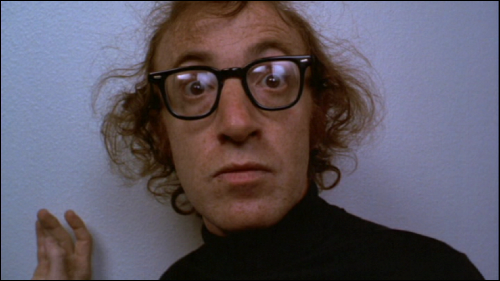 Woody Allen often looked stupefied after visiting the Sexatron. After audio or video oral histories are uploaded into OHMS, staff members create indexes and time-coded transcripts. Then, using the OHMS viewer, users can quickly locate the video or audio segment that they’re interested in without having to listen to the entire interview. Many researchers and journalists are excited about the Sexatro–I mean, Synchronizer. In fact, the number of people accessing the online oral histories at the University of Kentucky Library has increased exponentially, going from 300 interviews per year in 2008 to more than 12,000 interviews per year in 2018. But here’s the rub. In the oral history master’s program at Columbia University, we learn what makes a good oral historian. We develop a rapport with our narrators, which can take days, weeks, or even months. We sit in their kitchens, drink tea, nibble on cookies, pet the dogs, admire the family pictures. In some cases reciprocity means even more unique and sustained action and in other cases it means less, but there's always tremendous care. So when the interview is over, how do we upload into the Synchronizer the communal goodwill that comes from our collaboration? After we have established our relationship with the narrator, which should include a pre-interview and a robust discussion of informed consent and a release form, we get out the audio recorder or camera, don our headphones and press the ‘record’ button. As our narrators talk, we listen deeply in order to understand what they’re telling us. We watch their facial expressions, their body language and take note of their long silences in order to better understand the meaning. Life histories are nonlinear. They are ruminative, self-reflective, and move back and forth through time. Very quickly, these life history interviews can become intimate, and indeed we celebrate such deepening. Caught up in the drama of the co-creation, sometimes both the interviewer and interviewee forget there’s another presence in the room: the audience. If we’ve done our jobs, we’ve already discussed the audience with the narrator, explaining possible options for preserving the interview, including but not limited to archiving it in a public repository, storing it on a Website, circulating it on the Internet, or keeping it private for a period of time. Individuals who are accustomed to being in the public eye – politicians, activists, well-known creatives – often aren’t much concerned by potentially huge audiences. But other individuals cherish their privacy (Yes, Zuck, there are a few of those left) and they’re made uneasy by the idea that through some gizmo like the Oral History Metadata Synchronizer, a guy in Australia could soon know more about you than your best friend or your mother. Your mother might be really proud of you when she learns your secrets and the guy in Australia may be doing research in which your story figures prominently. But it’s important to remember that when quotes and sound bites are extracted from the interview, there’s always the possibility that information will be taken out of context. One reason people in the field are excited about OHMS is that, while it does allow you to navigate quickly to a piece of the interview, it keeps that piece in context, both in terms of keeping the segment as part of the interview AND in terms of keeping the audio/video linked to the index/transcript. Previous tools worked with clips that were taken out of the interview or with transcript divorced from the audio/video. Make no mistake, I like the idea of the Oral History Metadata Synchronizer. It’s making oral histories more usable and accessible and one day I hope to install it on my Website, which presently consists of investigative articles, as well as jacket covers and excerpts from several of my books. I’d like to include the raw data from future projects, including photographs, documents and oral histories. The interviews I’m currently conducting with aging activists who've spent decades fighting nuclear contamination could someday make invaluable contributions to a primer on grassroots environmental and/or political organizing. I want the archive to be available for such future uses. But before I upload my interviews, I’ll check a final time with the narrators and do a gut check myself to try to make sure there will be no unintended consequences when the interviews become widely available. In his OHMA Workshop Series presentation earlier this month, Doug Boyd shared how he has been caught off guard by some of the issues that have arisen once the interviews go live, including an issue about a drunk horse. Unanticipated controversies do occasionally slip through, even though the indexers at the University of Kentucky are trained to be on the lookout for oral histories that contain personal information, sensitive information, corporate secrets, criminal allegations, potential libel issues, culturally insensitive language, and so on. When I was a journalist, one of the writing coaches who came to the newsroom suggested that if we wanted to get the jargon out of our articles, we should look into our computers and pretend that we were writing to our mothers. That way, our language would be simpler and clearer. We laughed about that, envisioning our mothers in the dark computer screens in front of us, but there was some wisdom in remembering that we were communicating with a third party. Similarly, the interviewer and interviewee need to remember that there’s third party in the room: the oralhistorymetadatasynchronizer. With that in mind, there may be information narrators want to take out or additional information that they want to put in. Reporters collect information, organize it into stories, and publish the stories in newspapers. Oral historians co-create and collect stories, organize them, and take a pause before publishing. Many proceed digitally, and many of those partake of the Synchronizer’s services. Then when they click “publish,” their hours of intimately produced conversational narratives can be emulsified in milliseconds. The Internet is collapsing everything. Oral historians are becoming more like journalists and journalists becoming more like, well, let’s just say they’re being emulsified by the digital age. I have lots of questions and no answers. Does anyone know where to find a Sexatron? Eileen Welsome, who was awarded the Pulitzer Prize for unveiling an experiment in which eighteen people were injected with plutonium without their consent between 1945 and 1947, is exploring how trauma and memory of the experiment has impacted surviving relatives.